62% of you knit and 13% don’t know how to. 17% would like to learn how to knit and 6% have other things to do. In a society of mass production knitting makes it possible to make something original to wear. You can make anything from a simple scarf in your favourite colour to a complicated coat or dress. Whatever you knit you express yourself! 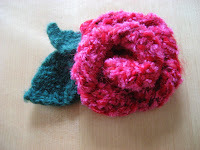 Here I have knitted a rose brooch that I use on blazers or cardigans. I would love to learn kniting, but i am not very patient.